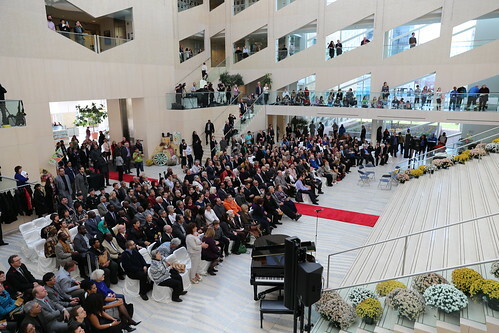 Edmonton’s new City Council was officially sworn into office this afternoon at City Hall. Councillors have been busy since last week’s election of course, learning how everything works, getting their staff and offices in order, and I’m sure, stopping every now and then to take it all in. But now their positions are official, and the real work can begin. The event was emceed by John Dowds and opened with an invocation from Elder Francis Whiskeyjack. With the help of Justice D. M. Manderscheid, each new member of Council took the oath of office in front a packed crowd. It wasn’t all business though, as Sierra Jamerson performed a beautiful song right before Mayor Iveson took to the podium to deliver his remarks. Mayor Iveson began with some tributes, acknowledging that Edmonton is on Treaty 6 territory, and praising the work of the previous Council. He highlighted the “vigorous pace” that outgoing Mayor Stephen Mandel had set and confirmed that he too will lean on “the diversity of wisdom and perspective” that each member of City Council brings to the table. Mayor Iveson talked about the importance of the Edmonton Region, the new relationship with Calgary, and the need to “firm up stable, predictable funding for key infrastructure, including LRT.” He talked about roads and pipes, fiscal responsibility, accountability and transparency, homelessness and poverty, urban living, innovation, the environment, the arts, and diversity and inclusion. It was the same messaging Iveson has been delivering for months on the campaign trail, but asserted with the new confidence that comes from being mayor. 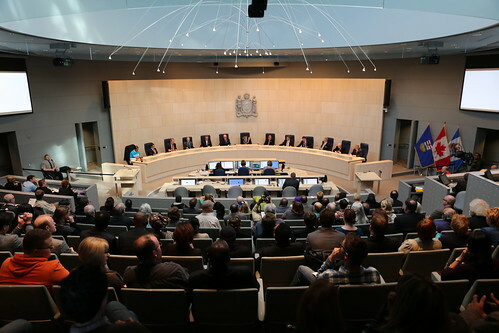 The inaugural meeting of the new City Council took place immediately after the ceremony. 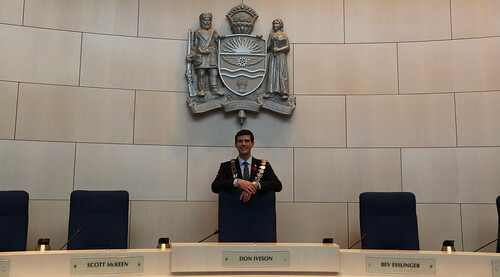 The first order of business was to adopt the agenda, and after the vote passed unanimously, Mayor Iveson let out a brief “whew!” that the much-larger-than-normal crowd enjoyed. The mayor gets to select the seating order. I’m not sure how Mayor Iveson came up with the order, but Joveena noted that experienced and new Councillors alternate, which seems like a smart approach. The returning Councillors are more or less in the same spots as before too. 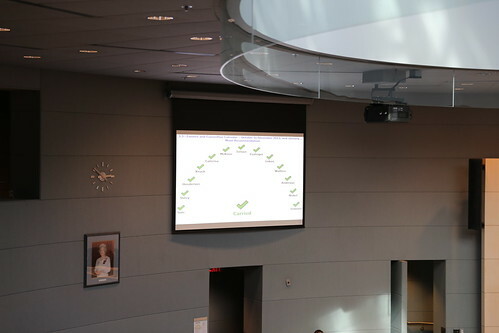 The meeting was very short, though Councillor Sohi did give notice that he intends to bring forward a motion in November to provide WIN House with $50,000 in funding. He was sporting a bright blue shirt that said, “This is What a Feminist Looks Like”. Now that it’s official, City Council will get down to business, starting with Strategic Planning tomorrow and soon, the 2014 budget. You can see the upcoming schedule as well as agendas and minutes here. Congratulations to our new City Council! You can see my recap of the 2010 Swearing In Ceremony here. You can see more photos of today’s ceremony and meeting here.